I may have jumped on the Frozen bandwagon a little late (I had never even heard Let It Go until the Idina Menzel/John Travolta fiasco) but I am on board now for sure. Why did it take me so long? I have no idea, the movie is phenomenal. Now, we have the movie, the soundtrack and a special place in our hearts for Olaf. So what comes next? Frozen crafts. If you love something, you don’t set it free, you make it a craft. 1. Print and paint your own Elsa, Anna and Olaf with these free printables from Learn Create Love. 2. Make Olaf from a paper bag like this one from Clearly Candace. 4. This Frozen glitter jar is beautiful! From The Country Chic Cottage. 5. You can pretend to have Elsa’s frozen powers with this DIY Frozen bracelet from Get Away Today. 6. 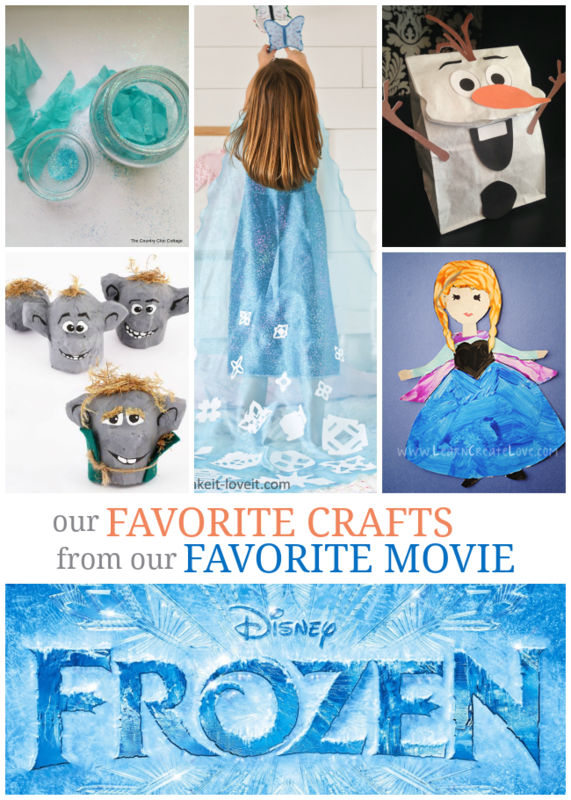 Have a little Frozen puppet theater with these make at home puppets from Hoyby Crafts. 7. This sensory bin is perfect for the little ones who love Frozen. From See Vanessa Craft. 8. No sewing necessary to make this pretty Elsa cape! From Make It Love It. 9. One of my favorite Frozen crafts are these Elsa gloves so you can pretend to make snow, too! From Brassy Apple. 10. Make Olaf in a snow storm bottle! Such a cute craft from 3o Minute Crafts. Me too!! I watched it for the first time this weekend after my 7 year old pinned me to the couch and begged me to watch… (life of a parent with a baby) It’s a lovely movie.. The songs are soo catchy. Love the paper bag Olaf!